Connect to any Fulfillment by Amazon (FBA) region with Order Desk to send your orders for fulfillment. Tracking information will be sent back to Order Desk from FBA as orders are fulfilled. This series of FBA guides will go over the setup, settings, uses and special features of the Amazon FBA integration. If you want to import your Amazon Marketplace orders into Order Desk, see the Amazon Marketplace integration guide. What's the difference between Amazon Marketplace and FBA? 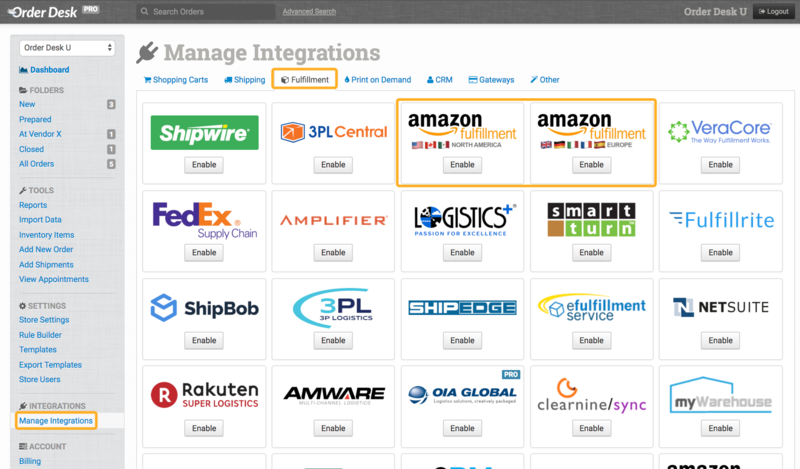 While both the Amazon Marketplace and Fulfillment by Amazon (FBA) integrations are part of your Amazon Seller Account (Amazon MWS), the Marketplace integration is for downloading Amazon orders into Order Desk, and the FBA integration is for sending orders from Order Desk to Amazon for fulfillment. Amazon orders that were fulfilled by FBA directly through Amazon (AFN) can be downloaded from the Marketplace Integration. The FBA integration is only used for sending orders to Amazon for fulfillment. Make sure you are connecting to the correct integration(s) when setting up your store. All five regions are available and can be found under the Fulfillment tab: Amazon North America, Amazon Europe, Amazon Japan, Amazon China and Amazon India. Click to enable the ones you need to connect to. Complete the connection between Order Desk and your Amazon FBA account(s) by following the prompts in the integration. Select the primary country for the region you are enabling from the dropdown. Click Login to Seller Account. This opens Amazon in a new tab. Keep Order Desk open in your current tab so you can copy some information back over from Amazon as you go through the next steps. To connect to the Amazon North American FBA, you will see the developer name and ID to take into your Amazon account. You will also need to enter your Seller ID and MWS Auth Token into Order Desk to complete the connection. Amazon has specific requirements for using MWS. If you're having trouble accessing these settings in MWS, make sure your account fits their requirements—more information here. This needs to be addressed directly with Amazon; Order Desk is not able to help. 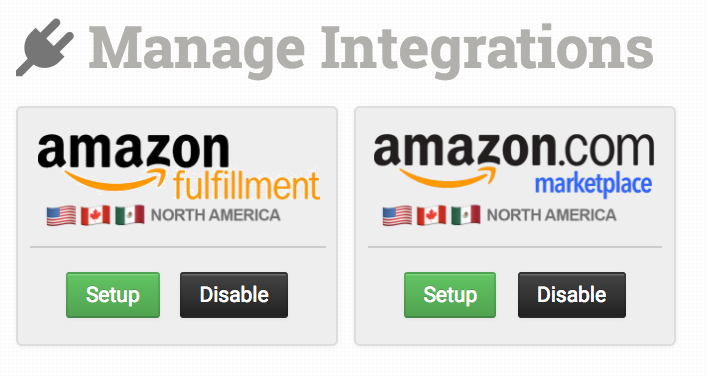 Once connected, set up your FBA integration with your preferences. For details about these settings, please see the Fullfilment by Amazon (FBA): Settings guide.